I love the excitement a new year brings. It's a clean page. A time to press restart and do a few things differently. One thing that I am committing to for this year is to spend less time on social media and use some of that time to blog more consistently. I enjoy the blogging community, the friendships I have developed over the years, and the fact that it enriches my life in ways that other forms of social media cant't do. I have found that the more time I spend on other forms of social media the more my heart and head are filled with feelings of envy, discontentment, etc. and that is not what I want or need in my life. So, what better way to kick-off the new year than with a post of my goals for January. I saw these categories on a post on Instagram and thought it made a good framework to work within as it encompassed mind, body and spirit. Do you make resolutions for the new year? If so, let me know what they are so we can help hold each other accountable. Here's to a month of new beginnings and staying committed. Let's do this! Once again another year has come and gone. It's hard to believe we are in the last few weeks of 2018. It seems just like yesterday we were trying out best to stay awake to ring in the New Year! I was going to do a glance back at 2018, but honestly, that is so overwhelming. So... 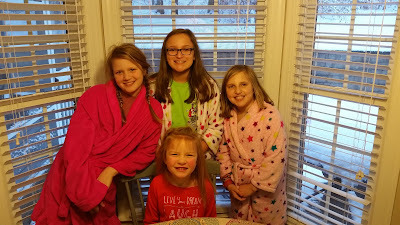 I will just post a few of our favorite memories from this month as we celebrate the holiday and begin to look forward to 2019. This year Mackaylan is playing basketball for LMS. 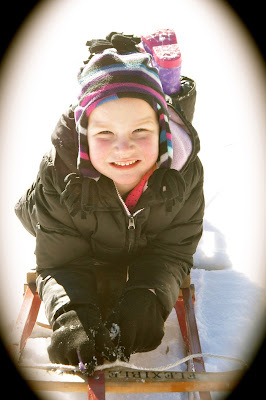 We are loving watching her play and push herself outside of her comfort zone. She is blessed with wonderful coaches who really are taking time to pour into her to make her the best she can be! She has started most games and was even chosen as a captain for one of the games so far. That was definitely a "Proud Mom" moment! I am looking forward to watching her play and develop the rest of the season. A few weekends ago we ventured up into the mountains of North Carolina to pick out our Christmas tree for downstairs. 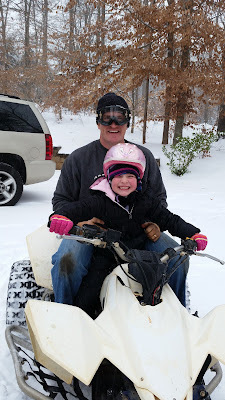 This is a tradition that we all love and we were glad we got it in before the snow storm and my back surgery. Speaking of snow... we had a great, big snow at the beginning of December. The kids loved playing in it, but Mickey wasn't so fond of all the tree work it required. Fortunately, we never lost power like lots of people in the area so we were able to make the most of a much-needed "pause" before the business of Christmas kicked in! 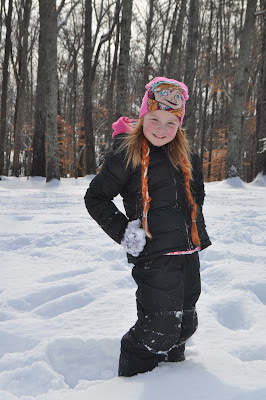 We were out of school for 3 days with this one, but it was worth it. This past Sunday Lydia had her Christmas play at LFBC. She was a narrator and member of the choir. She did a great job and knocked her lines out of the park! This week I am recovering from back surgery. I had to have a bulging disc removed in my lower back that landed me in the ER 2x in November. It's not ideal timing, but hopefully by the first of next week I will be feeling more like myself and able to enjoy the holidays with my sweet family. For now, I am enjoying my comfy blanket, Hallmark Christmas movies, and all the quality time with my family I can get! Last night we were invited to a neighbor's house for a special visit from Santa and Mrs. Claus. We had such an incredible time! 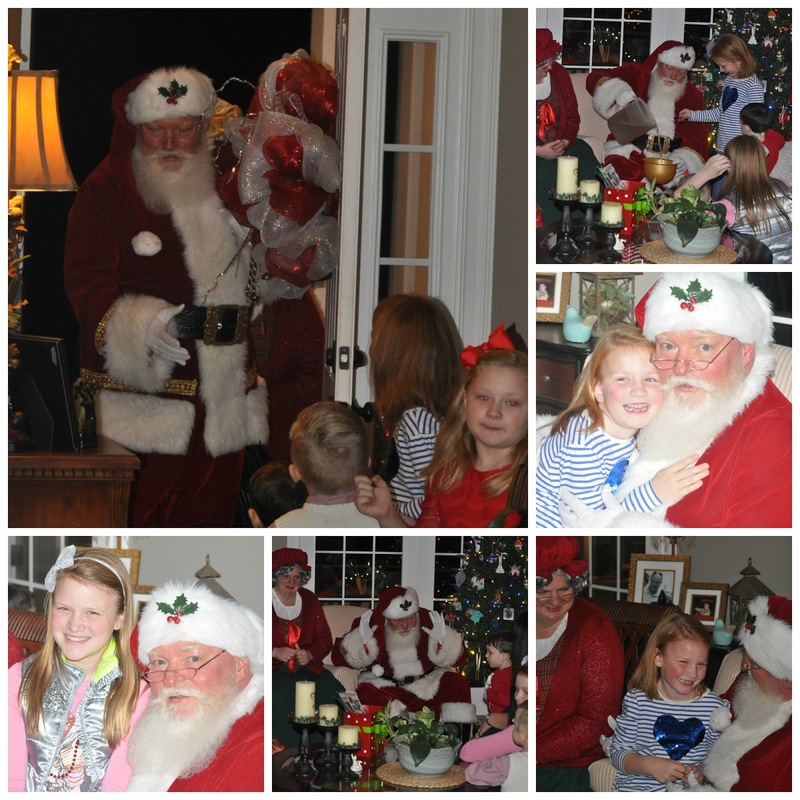 Once Santa arrived, he and Mrs. Claus answered questions from the kids, made magic snow, read Twas the Night Before Christmas, and gave out gifts! Ace attended the gathering too, but was more interested in all of the toys in the house than anything Santa had to offer. 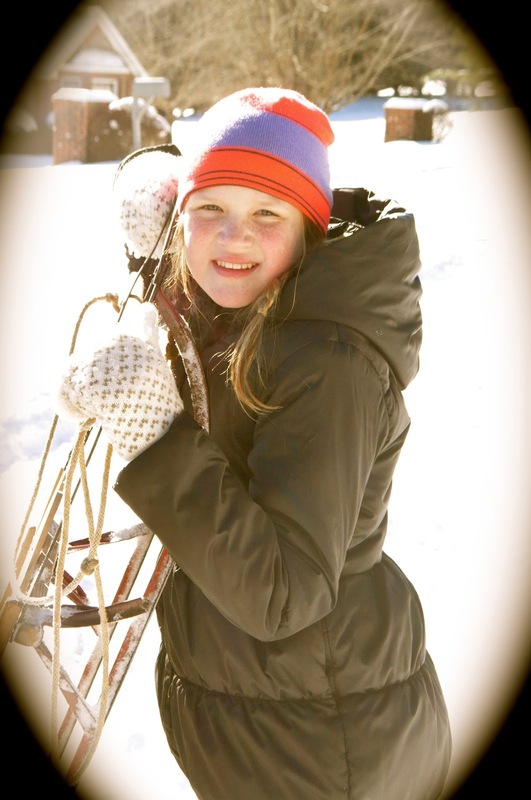 Santa made Lydia blush when he busted her on all of her chasing and aggravating boys! He also told her if she couldn't decide on what she wanted for Christmas that she would end up getting a pack of boy's blue underwear! Needless to say, she quickly remembered what was on her list! Santa agreed that Mackaylan has been a good girl this year and took note of the fact that she wanted an iPod 6 this year. I can't believe that we are one week away from Christmas! Here's to a week of family, friends, and lots of fun! 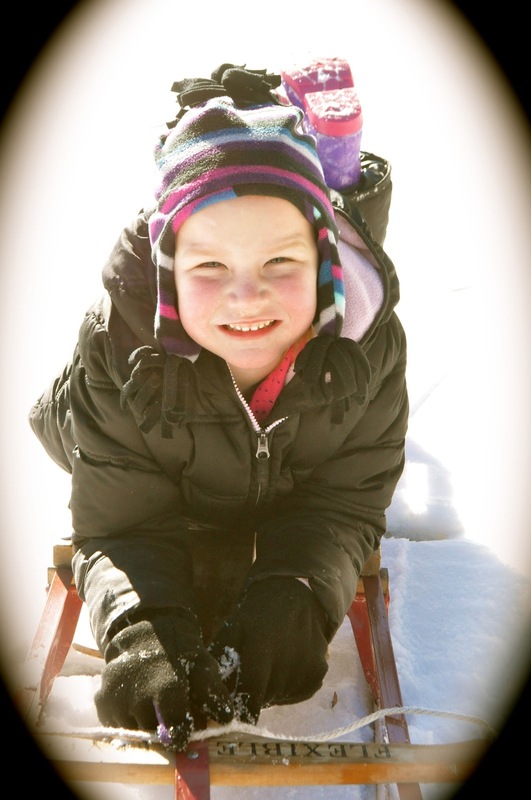 We have had a ball the past few days playing in the snow! It started snowing on Thursday night, turned to a sleet/wintry mix all day Friday, and then back to snow Friday night. In the northern part of the upstate we ended up with 7 inches. That's a lot for SC! I always consider a snow to be a success when Mickey doesn't have to go in to work, and he has been home with us for 3 days! And let me tell you... he has been the chief memory maker with the girls! He has spent many hours with them sledding, having snowball fights, and taking rides through town. I can't wait until next year when Bubsy is a little older and can join in the fun too! 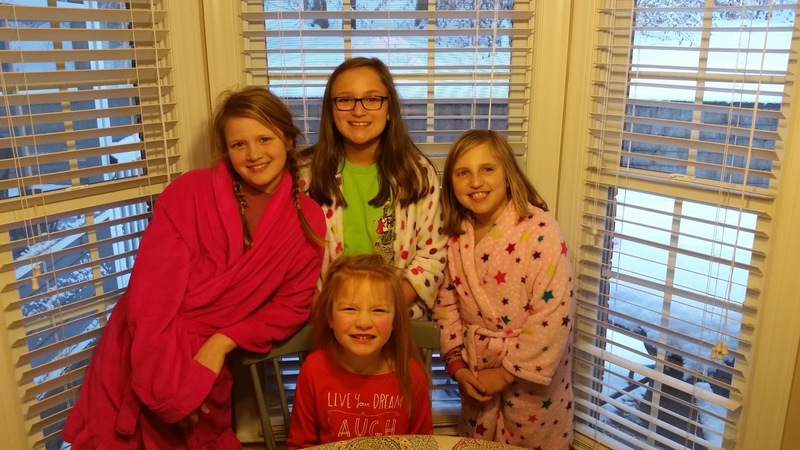 On Friday night, Mackaylan had one of her best friends and her sister over for a sleepover. They were staying with their grandparents who live in our neighborhood and they girls had spent a lot of time that afternoon playing together in the snow. 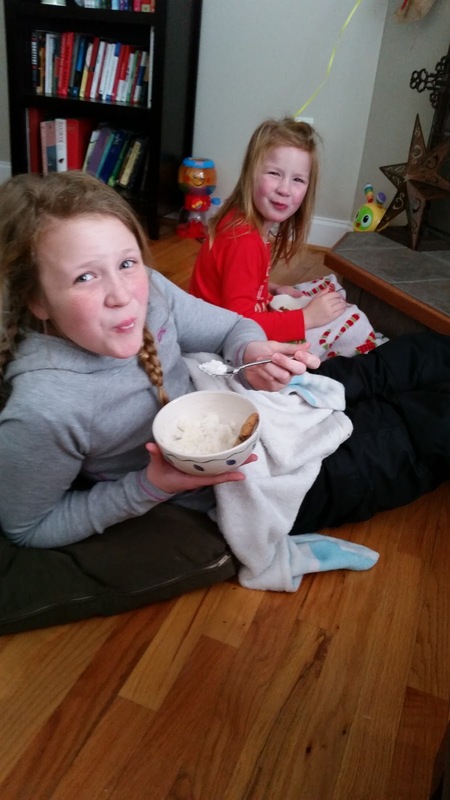 They came over after dinner and we took them back home on Saturday after lunch so they could suit up and all do some more sledding together. They all had a blast! Ace and I came back home before the rest of the crew so I had time to bake some chocolate chip cookies. 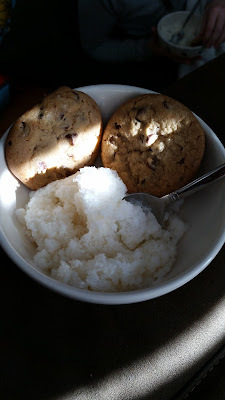 When the girls got home with Mickey, we made some snow cream to go with them. 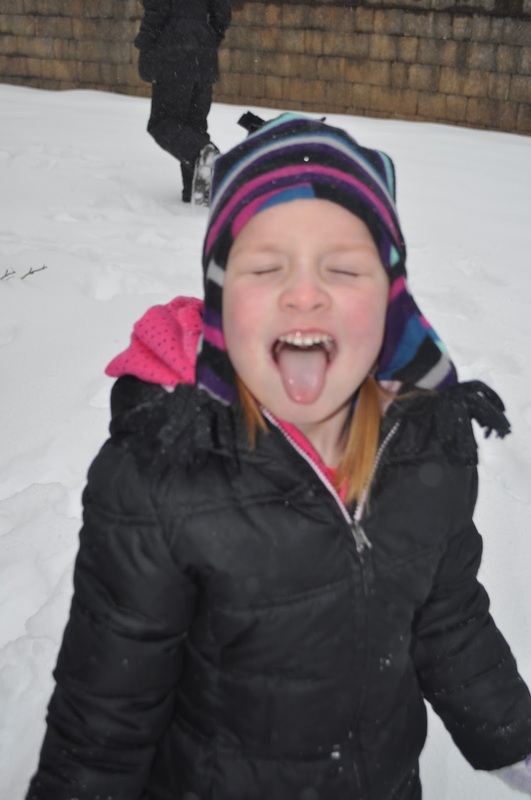 Lydia thought it was so cool that she was eating ice cream made of "real snow!" Church was cancelled this morning so Mickey headed over to his mom and dad's to get the "real sleds!" 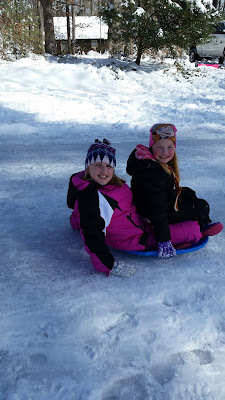 While we were waiting on him to return, the girls took turns sledding down the front steps of the porch on the disk. 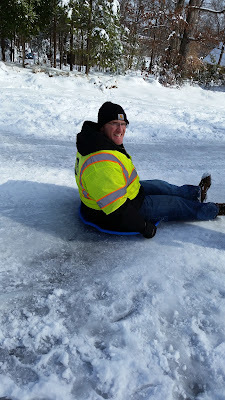 Once he returned, we all had fun sledding down the road. I love making memories with my family! Tomorrow we will enjoy another day at home because the backroads are still very icy and dangerous to travel on. A Monday at home with these 3 kiddos? I won't complain! Here's to hoping we have a few more snow days in our future this winter! 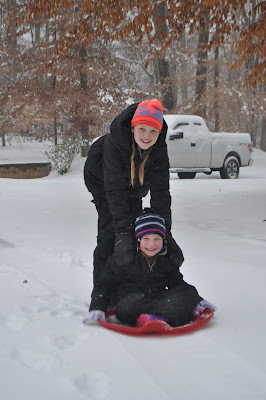 They are just SNOW much fun!!! 1. Spiritual: I have not been taking the time that I need to to read and study my Bible and spend time in prayer on a regular basis. For the coming year, I want to make sure that I am carving out time on a consistent basis (everyday) to do my daily devotion and pray. I'm not sure if this time will be first thing in the morning or after the kiddos are in bed at night, but this has got to be a priority! 2. Physical- I have really fallen off the wagon and it is time for that to change. It's amazing how much better i feel when I am more disciplined with my diet and exercise. I have tried WW on and off since Ace has been born, but this is the year to get this weight off! I have debated in my head trying the low-carb/low-sugar thing again, but I feel like WW is a "program" that I can live with long-term. 3. Professional- This year I have been going through Reading Recovery training. This is a one-on-one reading intervention program offered to first grade students. 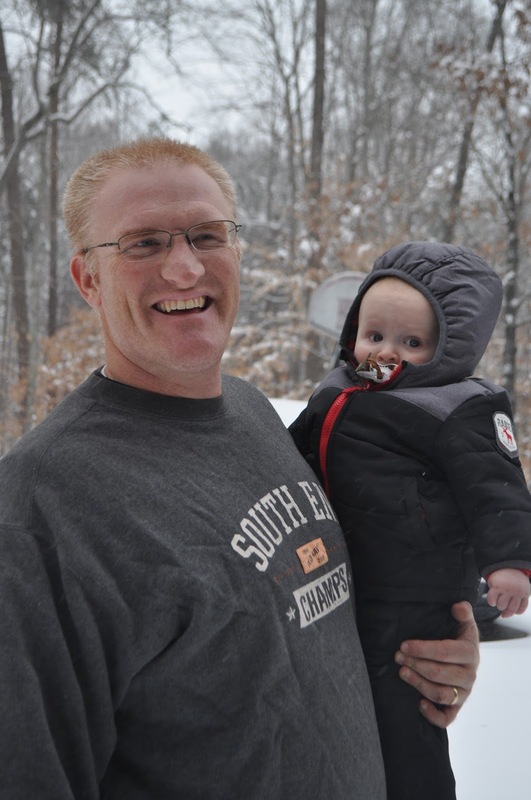 I am loving the training and working with the students, but am looking forward to "graduating" in the spring. I really want to work hard on keeping my lessons to the 30-minute time frame and doing my lesson planning and paperwork at school. This will allow me to get in more classrooms during ELA instruction first thing in the morning and keep my time at home with the kiddos and hubby "sacred." I could write down a few more professional goals, but I think I might save those for a blog post on my professional blog, Lana's Line of Learning. 4. 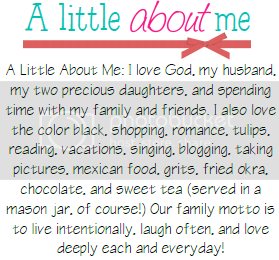 Personal- On a personal level, my goal is to update the blog at least 1x a week. I also want to have Mickey add a line in the budget to get the blog books we haven't had printed printed out so we will have them for the girls to look through. 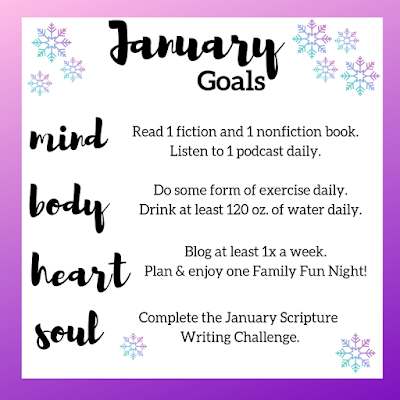 I have said from the beginning that blogging is my way of scrapbooking and documenting our life together so I need to do a better job of not just documenting the big, fun things, but also different aspects of our daily life. I also want to be consistent with tedious household chores so that the house and laundry stay in order. This means taking time each day to pick things up and put them back where they belong and to do a load of laundry at least every other day. These things sound simple, but as a working mother the last thing I want to do when I get home is clean and fold laundry! However, when my house is in order every other aspect of my life feels like it is in order too. Well, I guess I could go on and on with all of my goals for the coming year, but I don't want to have so many that I am not successful with any of them. I think that is why I like the One Word idea. While all of the things above are pretty explicit they all relate back to being CONSISTENT in some shape or form. My next step is to take my word and the list and create some kind of word art to hang as a reminder throughout the year! I love the start of a new year. It is full of new possibilities. New goals. New beginnings.